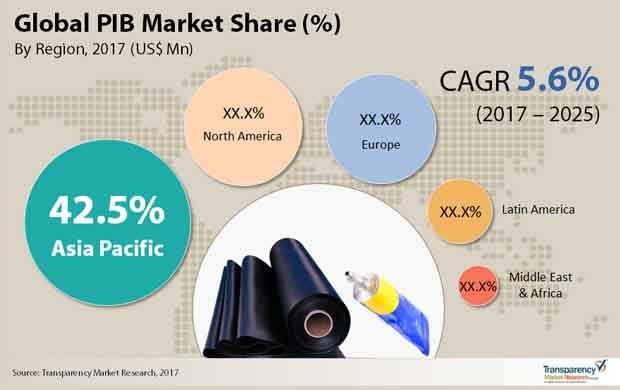 The global polyisobutylene market shows a high degree of consolidation with a small number of players controlling the business dynamics, states Transparency Market Research (TMR) in a new report. The top three players, namely, Lanxess, ExxonMobil Corp., and Nizhekamskneftekhim, collectively held a market share of more than 65% in 2016, thanks to their strong global presence. The key players in this market have taken up highly innovative marketing strategies, such as, integrated operations with patented technologies for the further development of their businesses. These companies are also expected to aggressively focus on mergers, acquisitions, joint ventures, and strategic partnerships in the years to come, states the research report. According to the report, the global market for polyisobutylene has been witnessing a healthy rise over the last few years. Analysts expect the opportunity in polyisobutylene to increase significantly from US$3.92 bn in 2016 to US$6.39 bn by 2025 at a CAGR of 5.60% between 2017 and 2025. The demand for polyisobutylene is relatively higher in the automotive sector than other application areas and this trend is anticipated to remain so over the next few years. Currently, Asia Pacific leads the global market and is expected to remain at the leading position throughout the forecast period. Rapid industrialization and the growing demand for automobiles are likely to fuel the demand for polyisobutylene in this region over the coming years. By 2025, the region is expected to hold nearly 60% of the overall demand for polyisobutylene across the world. The demand for automobiles is rising significantly across the world, thanks to the increasing disposable income of consumer. Tubes and tires, being an integral part of vehicles, are also experiencing a rapid surge in their demand. Owing to their impermeable nature, manufacturers of tubes and tires are increasingly utilizing polyisobutylene for the production of the inner liners of tires. With the introduction of tubeless tires, which are highly durable and require less maintenance, the demand for polyisobutylene in tires is likely to increase significantly in the years to come. On the other hand, the severe impact of polyisobutylene spills on the environment, particularly on water bodies, is projected to limit its application to some extent in the near future, reflecting negatively on the market’s growth, reports the study.